When did you start Daily Dress Me? 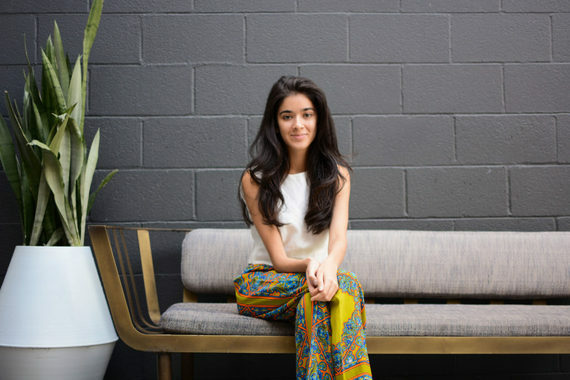 I launched Daily Dress Me in 2011 when I was 16 years old. It was the summer before my senior year of high school. 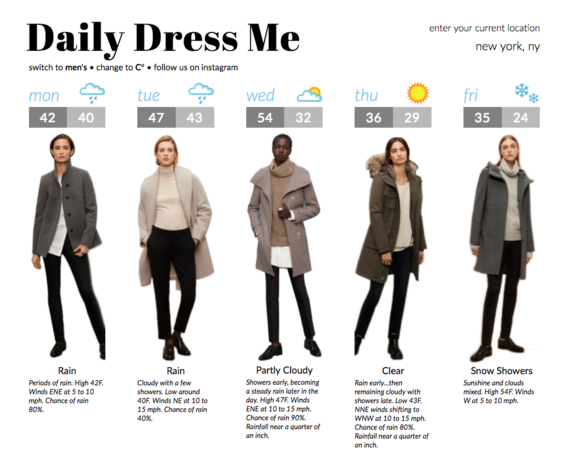 I was inspired to launch Daily Dress Me by a candid thought: wouldn't it be easier if the weatherman just told us what to wear? I firmly believe that looking good and feeling great are corollaries, so my goal was to streamline the everyday task of getting dressed in the mornings. I think it really boils down to intuition and curiosity. How has Daily Dress Me grown so far? The problem that Daily Dress Me solves is ubiquitous, so it resonates with people almost instantly. Organic and word-of-mouth are certainly a big part of our user growth -- people found it, loved it, told their friends about it, and then came back every single day. 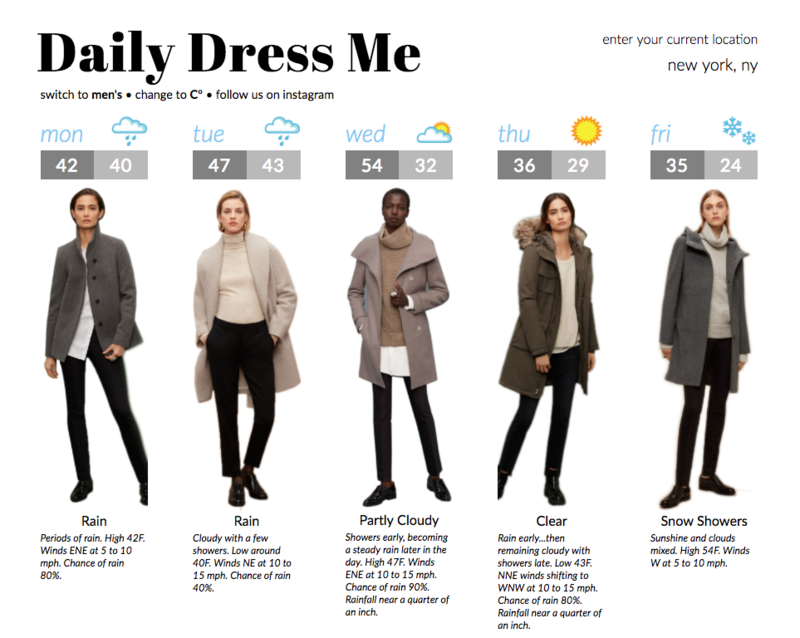 Some of our users have been consistently using Daily Dress Me for 3-4 years, which is amazing! How did you get brands and sponsors interested in the site? At first I sought out brands and pitched them on the concept. As Daily Dress Me grew, brands started approaching me to get their products in front of my audience. How do you decide what looks to feature? I like to keep things simple and trendy, so my users stay inspired day after day. The idea behind the site is that no matter what you do, where you are, or what the weather is like, getting ready should be the simplest part of your day. What has been one of your proudest moment so far? A few months ago, a hospital in Europe reached out to me to thank me on behalf of their Alzheimer's patients, who use Daily Dress Me every morning to help them get ready. That was definitely a rewarding moment! What have you found most surprising about the transition from college to the real world? I find it funny that when you're going to college, everyone urges you to enjoy it, as though it's your last and final chance of having fun. I'm very satisfied with life after college, and all the credit goes to Daily Dress Me. Every day, I wake up feeling excited and inspired for what's ahead. My work is arguably more demanding than homework, but for the most part, it is work I am eager to do. What is next on the horizon for DDM? Currently, I'm focusing on expanding our user base, pursuing thoughtful collaborations, and enhancing the core product through new features. How would you define entrepreneurship? To me, entrepreneurship is like an art form. Entrepreneurs wake up every day facing a blank canvas of possibilities and opportunities. Like artists, they tap into something deep within themselves that allows them to stay ahead of the crowd, bring their vision to life, and inspire others to be better themselves. Do you think entrepreneurship is different for women than men? I believe entrepreneurship is truly an individualistic pursuit and is therefore different for every entrepreneur, let alone if you are a woman or a man. That being said, I think that women and men have a lot to learn from each other. I highly recommend the book. "Shakti Leadership," which suggests that the key to being a successful leader is balancing nurturing feminine principles with practical masculine principles. What's your favorite cold weather look that's trending right now? I'm really into wearing monochrome outfits, which are great for colder months because you can have a lot of fun with layers. My favorite trending color right now is winter white, just because there's something really endearing about the sight of white when it's cold. I should also mention that it's my first winter back in Los Angeles after 4 years in Boston, so cold weather takes on a very different meaning for me this season.